Celebrity Guest BIG Announcement at Gensee Valley! By TheHUB on 07/19/2018 Comments Off on Celebrity Guest BIG Announcement at Gensee Valley! 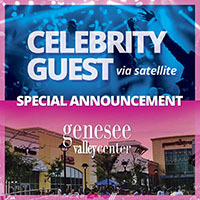 YOU WILL NOT WANT TO MISS THE BIG Announcement happening at the Outdoor Village Genesee Valley Center on Thursday July 19th starting at 7PM! SPECIAL CELEBRITY GUEST Announcement during the performance! ALSO local celebrity Morris Peterson and a special appearance by Genavieve Linksowski from American Idol and Mike & Stephanie from CK105! There will also be prizes, drinks, food, a face painter, balloon artist, and FUN for the whole family!!!! Arrive EARLY, will be packed! !